The Old Testament is simply a shadow of which Christ is the reality. For instance, as I walk you can see my shadow that is being cast. My shadow has to do what I do. If I lift up my hand my shadow better lift up his hand. If I start dancing my shadow better dance. My shadow has to do what I do. My shadow is proof positive of two things. Number one, I am real. I’m not a ghost. And, that there is a light in the room. Hear me, when Jesus stood in the light of who He was He cast a shadow which is simply the Old Testament. The Old Testament is just a shadow of which Christ is the reality. If you look at my shadow you don’t get distinctive features when you look at my shadow. You can’t look at my shadow and know what color my skin is or my eye color. You know why? It’s just a shadow. That’s why, when you read the Old Testament, there are certain characters that are just giving us previews of the coming attraction. They are not Christ but they are just pointing to what Christ is going to do when He steps on the scene. So with that in mind, in Numbers 11:1-6, we understand that the children of Israel become a shadow of the Church. Moses becomes a shadow of Christ because he was born for no other reason than to bring salvation, liberation and deliverance. Pharaoh becomes a shadow of Satan. Egypt becomes a shadow of sin which is why Pharaoh wants them to stay there. It’s just a shadow of which Christ is the reality. At the Old Testament Passover they would kill an innocent lamb and then sprinkle the blood of the lamb on a wooden door post. That’s a preview of another Lamb who was going to be killed. But his blood is going to be sprinkled on a wooden cross. Death has to pass over your life when it sees the blood of Jesus. It’s just a shadow of which Christ is the reality. The Red Sea that they cross over is just a shadow of baptism. If you’ve given your life to Jesus, the next step is to be baptized. It becomes a shadow of baptism because it says, “When I come through this water, the old me is in Egypt, but the new me is coming out of the water, walking into my purpose, my destiny, into the place that God has for me.” If that doesn’t make you praise God something is wrong with you. After the children of Israel saw Pharaoh and his men and horses drown they started praising God. That’s why I can always tell when people have been set free from something. You don’t ever have to coach them in worship. You don’t ever have to say, “Come on, would you press in tonight?” No, those people just need a flashback of where they should’ve been and where they could’ve been if it had not been for the grace of God and praise will erupt out of them! But once the euphoria of their emancipation had been eradicated, a fancy way of saying: once the excitement and thrill was gone, once the service was over, they’re now faced with a question that you always have to ask yourself anytime you have an encounter with God, and that question is this, “Who am I now? I know I am no longer a slave and now I’m saved. But how in the world do I walk in that when I’ve been a slave for so long? Let me say it another way, “I know I’m out of Egypt, but how do I get Egypt out of me? This precious couple were both filled with the Holy Ghost in one of our recent revivals! The power of God is flowing mightily!!! This is what most people don’t understand about Christianity. Christianity is initially a change of status more than it is a change of behavior. He takes them out of Egypt. In a moment their status changed. I’m not a slave; I’ve been saved. The challenge before I step into the Promised Land is how do I get my behavior to come into alignment with my new status? The challenge that faces us every single day we wake up is, “God, how do I get my behavior to come into alignment with the status that you procured for me on the cross?” and that is a process. Don’t give up in the process because God is forming and shaping you. If you will just trust him in the process you will become what He called you to be and what He saw in you from before the foundation of the earth. You just keep trusting Him. It’s a process. My grandfather met and married my grandmother in Paris, France during WW1. When she came to America as a war bride she was granted U.S. citizenship because she was married to my grandfather. When she became a U.S. citizen she did not wake up the next morning after she became a citizen and say, “Hello, my name is Emily Cent Todd, and I am now a U.S. citizen.” How many of you know it didn’t happen like that. If anything, she woke up and said, speaking French, “Hello, my name is Emily Cent Todd and I am a U.S. citizen” Obtaining U.S. citizenship did not automatically teach my French grandmother the English language or the American culture. This woman’s heart had been out of rhythm and fluttering for several years. God healed her instantly in one of our recent services at Cornerstone Assembly in Ward AR. Healing virtue is flowing!!! The enemy loves to come in your mind and get you to doubt your citizenship in the Kingdom of God just because there are some areas in your life you are still weak in. That’s when you need to look at the devil and say, “You’re a liar. God is not through with me yet. I am still a citizen in the Kingdom of God. I’m not perfect but I’m in the perfecting process. And sooner or later God is going to form me and shape me and I will become who He’s called me to be.” Hear me, you are still a citizen in the Kingdom of God. Don’t give up just because you are in the process. God takes the children of Israel through the wilderness because he’s trying to get Egypt out of them. The wilderness is a tough place to take somebody. I thought, “why did he have to take them to the wilderness?” There’s no life in the wilderness. In Genesis, God never said, “Let there be wilderness.” But sometimes God will allow you to go through a wilderness. Sometimes He will remove your resources so that you will know that He is your source. Sometimes He will strip some things away from you so that you can see that He is the only single thing that you need. 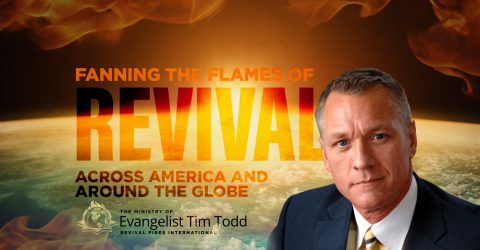 In recent revival services at Trinity Assembly of God in Little Rock AR we had a massive amount of people saved, filled with the Spirit, healed, delivered and set on fire for God!!! God is pouring out His Spirit! He takes them through the wilderness because He’s trying to get Egypt out of them. God did all kinds of miracles. Panera bread started falling from the sky. Moses hit a rock, Fiji water starts coming out of the rock. The bible says that as they walked through the wilderness their clothes never wore out. I’m thinking, “God they’re in the wilderness. Nobody’s even looking at them,” and God’s like, “I still want them to look fresh and clean.” That’s scripture for shopping. You would think that after God brought them out of Egypt they would wake up every day saying, “God thank you so much for bringing me the victory and setting us free.” That’s not what they did. The bible says that one day they got up and they said, “Lord, we want to go back to Egypt. We want to go back to slavery.” What??? What in the world would make somebody cry out to go back to something they had cried out to get out of? It’s the predicament of the process. Because the predicament of the process is that it is so much easier to go back to what is familiar than to trust God and walk by faith. It is so much easier to go back to what you have always known than to say, “God I’m going to trust you for what’s ahead and I’m just going to keep on walking. God is saying, “Don’t go back to the familiar.” You’ve just got to keep on walking no matter how hard it is. Because God has so much more in front of you than what’s been behind you. So you’ve just got to trust him and just keep walking. Just keep moving forward because your destiny is so much greater than your history. And if you just keep walking He’s going to lead you to the place that He has already prepared for you. Whatever you do, just keep walking. You can’t go back. I heard about this police dog specialized in high speed chases. One day this police dog was running out and chasing a suspect. The dog went out in the middle of a busy intersection. Cars going by. A car didn’t see the dog coming out on the highway, slammed on his brakes but it was too late. The car hits the dog. The impact was so intense that the car completely crushed the dog’s hind legs. The dog survived the accident but it affected its walk. It caused the dog to walk by flailing its legs in front and dragging it hind legs behind. Come to find out when the dog got hit it was pregnant with puppies. The dog gave birth to the puppies. Amazingly, the puppies were healthy, beautiful, nothing wrong with their legs. But when the puppies got ready to walk, guess how they walked? By flailing their front legs in front and dragging their hind legs behind. And the veterinarian had the hardest time to get these puppies to realize…hello! There’s nothing wrong with your legs. You’ve just been modeling the dysfunction that was placed in front of you. So the veterinarian began the process of teaching these puppies how to walk the way they were created to walk. Teaching these puppies to walk the way they were designed to walk. Teaching these puppies to walk the way their creator intended for them to walk. Revival Fires are burning bright!!! Every time you come in the house of God and lift up your hands in worship, do you know what God’s teaching you to do? He’s teaching you to walk the way you were created to walk. He’s teaching you to run the way he designed you to run. And God sent me to tell you to keep on walking. You can’t go back. There is so much more in front of you than what’s been behind you. If you are ready to keep walking then stop reading this right now and give God some praise. We’re going to keep moving forward. Don’t go back to what’s familiar. Keep walking by faith. Your destiny is so much greater than your history. You’ve just got to keep on walking. How many reading this would say, “I am walking with the Lord but the reality is, I’ve been so tempted to go back. I just need the strength and the grace to keep on walking.” I believe that as you read this God is wanting to silence the voice of the enemy. And the voice of your Father is going to become so much louder. He’s telling you in this message just to keep on walking. You cannot go back. God’s plan in front of you is greater. PRAY FOR OUR CUBA CRUSADE! WE WILL DISTRIBUTE 20,000 BIBLES TO 20,000 NEW CONVERTS!! !